>>I'm an Order Of the Dragon enthusiast... This has absolutely shut my eyes to my love for the notorious impaler. Ugh. Terrifying. I've read some scary stuff but wow, this was almost like an authentic "interview with the vampire" great horror\history read. >>I loved this book! It was as grotesque as I expected it to be, yet oddly humorous at times. How he can be a hero to some is beyond me. Yep, I'd recommend this story and author. >>It's a little unusual. It's seems to be a dark comedy screenplay treatment of Vlad Tepes life and times complete with screen direction. It's not a great primary source for understanding the historical Dracula. But it's an enjoyable read if you are already acquainted with the historical Dracula and are just in the mood for some light reading. It sticks with the German perspective, where Dracula is a villainous monster, but I found myself laughing out loud (perhaps inappropriately) as Vlad dishes out his own twisted brand of justice with his henchman Dragomir. >>Well researched and informative! Learned a lot of facts from this book than by reading online articles about this epic prince! >>It's almost like National Lampoon's humor but very graphic. Very funny at times. 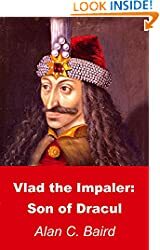 >>Before traveling to Transylvania, this was a helpful read to understand the mythology of Vlad. Our guides affirmed the correctness of this book.